Luxury travel is experiencing an about face. It’s no longer just five star hotels, vintage wines and helicopters. The millennial generation may not have the same deep pockets as their baby-boomer parents yet, but their growing social influence is impacting major trends in travel, specifically transformative journeys. These 20 and 30 somethings, are entrepreneurs who straddle a fine line between hippie values and living off the grid, with being urban trendsetters from major cities like New York, San Francisco and Los Angeles. They may stay in a luxury hotel and camp in the same vacation, as long as there is a transformative experience or deep personal connection involved. I decided to dig deeper into the growing trend of transformative travel and how especially Millennial travelers are seeking more meaningful experiences and genuine local connection every where they go. My adventure began in the jungles of Panama at  Kalu Yala, a self-proclaimed mind spa and sustainable eco-lifestyle development, where I met the CEO, Jimmy Stice, an Atlanta native, to learn more about the intersection of travel, sustainability and social good. The jungle immersion provided a platform for cultural exchange and diverse experiences, such as connecting with the local community through food, hiking, and dancing before my adventure led me to the beaches of Bocas del Toro to explore how education and surfing can work hand in hand. “I think that right now, we are living in a very globalized world where not only are we traveling more, but we are communicating more with people at greater distances. And I think that’s exciting, because it’s allowing for an interexchange of culture, knowledge, ideas and experiences. And so we can come to Panama and we can have a completely diverse experience from the local culture and from other countries as well, who bring their own stories to tell.” - Click here to watch more of my interview with Jimmy at Kalu Yala. Values like connecting back to oneself, the local community or the planet are important ideals shared by this generation, so are buzz words like awakening and education that lead to true transformation. What better way to immerse yourself in a culture than to explore the significance of the connection between the land, the local flavors and the quality of life for each destination’s residents? Food is the entry point to these experiential conversations that everyone can connect with. Breaking bread together has been an age-old way to greet strangers that expose travelers to conversations with people who live differently. These “things you learn at the dinner table” with perfect strangers are now sought after experiences to generate new ideas and stories that ultimately lead to continued conversations at home. This social currency is having a global impact. Adventure comes in many forms for millennial travelers and it’s not just about the rush. It could be silently connecting with yourself or fellow journey seeker by practicing yoga, hiking in the jungle or dancing under the stars. But the most impactful activity for me in Panama, was connecting with the local community through surfing. "Surfing is all about that magical moment when the surfer finds integral connection when nature, when you and the wave become one, in a sense. We started Sustain The Stoke because surf travel should be an extension of that phenomenon. Surf Travel should be a deep and meaningful connection between the traveler and the inhabitants of the destination. Our goal is to redefine the surf trip as an act of social, environmental and cultural good. We've been fans of Give & Surf for some time now, and jumped on the opportunity to work with Neil and his crew. Impact and sustainability have become words of the day. But while many talk the talk, Give & Surf walks it too." - Click here to watch my interviews with the founders of Give & Surf and Sustain the Stoke. 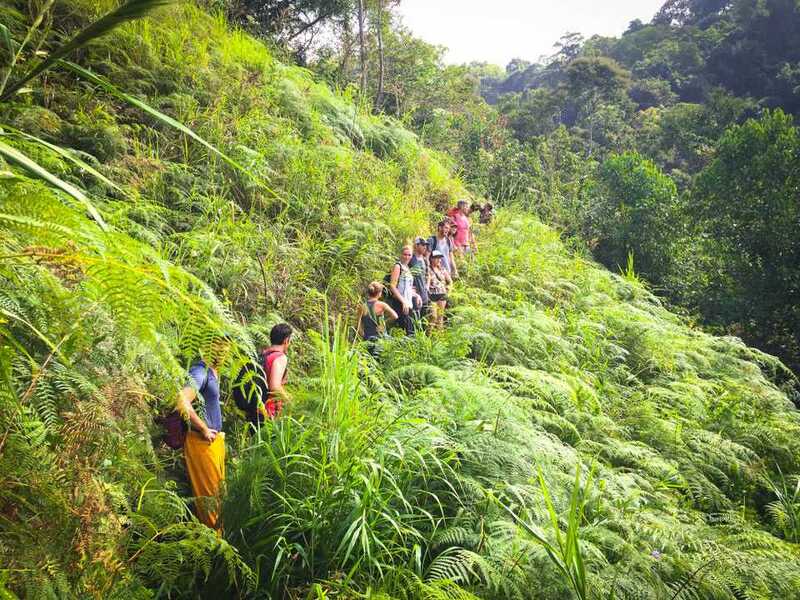 It should be no surprise that these travelers are looking for more than just the off-the grid tourism experiences, it’s not about isolating yourself from the world or escaping, rather it’s about being immersed in a community and coming alive. For more information on transformative travel or Panama, check out OhThePeopleYouMeet.